Oilseed Cracking Mill is designed to crack larger seeds, beans and nuts into smaller pieces, this mill is required only on certain materials. 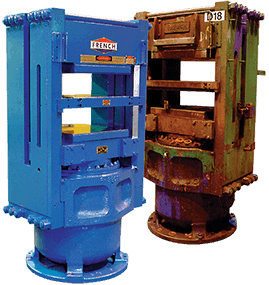 Our Flaking Mill machinery has the capabilities to flake smaller material, or cracked material, to a thickness of .012" to .015”. Manufactured with rigid sliding bearing blocks mounted on precision machined keyways and a one-piece cast iron base to minimize vibration, maximize roll life and help maintain precise roll alignment. Suitable for full press or prepress use in laboratory, pilot-scale and small-scale vegetable oil extraction applications. An extruder used to pelletize oil-bearing seeds or pre-press cake. Vessel to condition the material to the ideal temperature and moisture content to obtain the maximum extraction of oil in the screw press. Drum or plate-type magnet to remove any steel material in the feed stream. If the material has not been pre-cleaned, a cleaner is recommended. Bin to provide a steady and even flow of material to the process equipment and is an overflow bin from the cooker/conditioner feed conveyor. Required to cool the solids (press cake) from the screw press so that the material can be safely sent to storage. To remove larger solids in the crude oil extracted by the screw press. To remove the smaller particles of solids in the crude oil from the oil settling tank to produce filtered crude oil. The oil extraction process also requires auxiliary equipment including process tanks, pumps, instrumentation, conveyors, motor control center, electrical wiring and conduit, aspiration equipment, piping, air compressor, and storage bins and tanks for the raw material, filtered crude oil and ground cake. French can assist you in your equipment needs by supplying individual pieces of equipment and/or all of the major and auxiliary processing equipment.